Here’s a peek into the crafting techniques, materials and tools required to do it yourself. Whew! Glad to hear that. What materials and products are needed for making silk flowers? More good news! 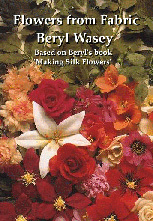 You can easily obtain fabrics of cotton, polyester, crepe, silk and satin to make silk flowers. You can even use white cotton sheeting and dye it to any color desired. Material of varying thickness, different textures and fabric facings can produce different effects. In general, a starch coating is applied to the fabrics, which are then formed and shaped. Where can I find complete instructions for making my own silk flowers at home? 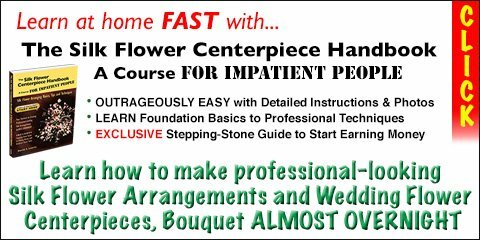 For a walk-through example of the basic procedures, click here to view illustrated steps online for making silk flowers yourself. Unfortunately, both seem to be no longer in publication. She also offered the special TOOLS that would help you make silk flowers at her website, www.makingsilkflowers.com, which seems to be no longer operational. She had thought of everything for you, BUT you might still find these items via internet search.